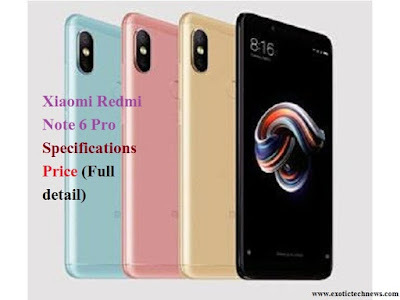 Hi friends, If you want to know the complete and full specification and price of Xiaomi Redmi Note 6 Pro then you are is in a right place because here in this article I will tell you “Xiaomi Redmi Note 6 Pro | Specifications | Price“. As we all know that lots of Smartphones or Mobile Phones are coming day by day and recently Realme 2 Mobile Phone launched and so many peoples said that this is the end of Xiaomi Redmi Note 5 Pro but you know Xiaomi has set his name in the market and Xiaomi becomes the most popular mobile brand in the market. Xiaomi Redmi Note 6 Pro comes within two variant of ROM and RAM having 32 GB of an Internal Storage with 3 GB RAM and 64 GB of an Internal Storage with 4 GB RAM. Xiaomi Redmi Note 6 Pro have latest Snapdragon 670 processor which is an Octa-Core Processor and this Snapdragon 670 Processor of Xiaomi Redmi Note 6 Pro will be the largest Processor as compared to Xiaomi Redmi MI A2‘s Processor 660. Before the Xiaomi Redmi Note 6 Pro ‘s series, we have not seen the Notch Display except Poco F1 but in Xiaomi Redmi Note 6 Pro, we can see a Notch Display which is also the best thing. Xiaomi Redmi Note 6 Pro can have two Rear Camera of about 16 and 12 Megapixel Camera and one Front Camera of about 20 Megapixel Camera. In Europe, the price of Xiaomi Redmi Note 6 Pro will be 200 Euro to 250 Euro which is the best price for this type of Smartphone and if you are from India, the price of Xiaomi Redmi Note 6 Pro can have 12990. According to the Vice President of Xiaomi Company Manu Kumar, he tweeted on his twitter account that, MI fans, we have got more than one! Coming very Soon and I am very super excited for this. But according to NDTV Gadget, Xiaomi Redmi Note 6 Pro was launched in the 5 September. So friends in this Article, I told you the “complete and full specification and price of Xiaomi Redmi Note 6 Pro” and if you have any types of Query then just Put you query on Comment Section and also if you have any Suggestions then do Comments because Comment box is only for you guys.